may be enlightened or unenlightened. 2,500 years before The Matrix hit the big screen, Plato posited the idea of the Cave. In it there are prisoners, forced to face the wall, unable to turn around. Behind them is a fire. People cast shadows on the wall of the cave with puppets. The prisoners, if kept there long enough, or born into their condition, come to believe that the things they see on the wall are reality. Take a man away from the wall and show him the fire, and he may think it a vision, and seek to turn back to the “reality” of the shadows. Take him outside into sunlight, and he might go mad. If he survived the shock of the real and returned to the cave, and attempted to communicate the truth to the other prisoners, they might set upon the lunatic. In thinking themselves to be closer to the sun than the cave, readers make a significant philosophical statement about their lives. But is that statement really true? 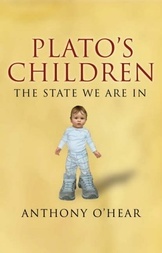 In 'Plato’s Children' Anthony O’Hear asks: are we in the cave? That cave need not be the dark and unhappy place that Plato envisioned; it might be pleasure-filled with things of distraction and happiness. Given the choice, do modern Britons prefer the cave, with its comforting visions and provision by others, to the dazzling sunlight, and a world in which we must provide for ourselves? The conservative answer is clear. However bad the reality, we choose it and seek to struggle with it, to accept life’s challenges and take on the burden of overcoming them. We would seek to stand up for ourselves and those around us, to strive and not to yield: to mould the unpleasant reality into a better one. Not so for some in society. For some, an easy life and guaranteed provision is preferable. These are the souls who, faced with Neo’s choice, take the blue pill: they prefer the comfort of unreality to the struggle of reality. There is a parallel to be drawn between the cave and the state. For the power given to the state by blue pill people is vast. We infantilise adults. The state limits income by its swingeing taxation, and in return it provides all the significant elements of social living: education, health, pensions. Having no significant choices over their lives or the lives of their children, adults spend their money like children. There’s no need for responsibility; rather, one should spend in order to make oneself temporarily happy. As Keith Joseph had it, adults now have pocket money from the state. For those dependent on it, the message from the state is, stay there. Don’t bother saving, as you’ll lose your benefits or pension. Why seek to provide for your children, you mug? Let the state do it. Many parents prefer that because they are free to pursue their own visions than face the reality of responsibility. And so, with the implicit consent of the citizenry, we reach the state of affairs in which the state thinks that it owns children. And so we travel deeper into the cave. O’Hear asks more difficult questions. What if there is no Platonic enlightenment, no sun? Isn’t the cave preferable then? What if the thing outside the cave is not the sun, but the teachings of Bin Laden? Then, isn’t it the case that ignorance is bliss not only for those in the cave, but also for the rest of us? The questions are provocative; his answers are gripping. Of the Matrix and the cave, it is the Platonic cave that is the better allegory for our societal dilemma, for “it is a moral turn we should be looking for, not some technological deliverance.” Escape from the Matrix requires mechanical trickery; freedom from the cave needs only moral will. There is no doubt that “enlightenment is long, slow and painful.” But to O’Hear and, I think, to us, it is preferable to that other, darker life and this book offers a powerful case for choosing freedom. I should give a disclaimer: I know and like Anthony O’Hear. I nevertheless believe my judgment to be dispassionate when I say that this is the most important conservative book to be published for some time, and it should be read forthwith by anyone so discerning as to frequent this site. Tricky allegory, but I think I understand the point you are making. Interesting analysis. At the moment I confess I have little faith in the ability of the people to face the truth. Decades of socialism, only partially mitigated by the Tories, has blinded most people to a real alternative. I actually found this book somewhat incoherent as it ranged widely over so many subjects - from human cloning to Victoria Beckham - that the analysis of our social and cultural predicaments seemed unfocussed. It also seemed a book which, though asking some important questions, relied too much on ad-hoc anecdotes and writing that occassionally descended into a rant. The chapter on education, for example, which made some good points was almost fatally undermined by a many tyopgraphical errors. Did somebody actually read through the typescript before it was published? Also, I was left feeling unclear on the so what now question. The best O'Hear could come up with, it seems, a universal return to religion or more particularly Christian religion. A pretty predictable and unexplored answer given the complexity of our times. I, of course, meant 'typographical' errors! !